Gilkocks’ Ebrima Jatta, alias E.J, has completed a three week trail with Reading Football Club in England. Ebrima's invitation to Reading came about following his wonderful performance in the league and his participation in the recent Fifa World Youth Championship in Canada. According to Ebrima, he trained three weeks with Reading FC and played two test matches with the team. When asked whether the team showed some interest in him, he said "after my first test match everybody in the team including the officials were impressed with my performance and have been saying good things to me but my only problem are the regulations in England; the work permit and the 75% national team appearance which I am yet to back". He also stated that his age was another problem as the team had wanted to keep him in the academy for a while but he was already 20 and the academy is meant for players under 18. Ebrima further stated that the team and my British born agent Ambrose Mendy are working on modalities to send me to another club in Europe before I may acquire the EU passport or meet up with the 75% national team appearances. Eamonn Dolan, the coach of Reading FC, hailed Ebrima's performance during the trial and described him as wonderful. Dolan added that Ebrima has the potential to become a fantastic defender in the future if he is given the chance. He is very keen and hungry to play. He maintained that the club and the agent are talking and hopefully something positive comes through soon. Allan Nevado is student of the university of Ballerup Seminarium currently in the Gambia on attachment has spent two days at the Brufut based Gilkock Football Academy. Allan, who is studying Youth, Sports and Games at his university but in deep love with the game of football wasted no time in responding to the call of the academy in the soonest. Acting more or less as an observer on Saturday, Allan confessed to the coaches of the Academy that the standard of the interns of the Brufut Academy is higher compared to the ones in Denmark but was also quick to add that the interns need to learn to work as a team when playing. Therefore revealed to the coaches and interns that his training on Sunday will be centered on team play and team spirit. Allan noted that it is important for players of at young age to be thought how to accept their team mates and also learn to always say thank you, keep it up or try hard next time. After the session on Sunday, Allan went into a lecture session with the interns of the academy. The lecture session which was intern centered was described by many of the interns as the most educative part of Allan’s session. Max Jallow who facilitated Allan’s trip to the Academy thanked the academy coaches and players for their perseverance and quickly advised the players to be committed to the game, to be respectful to their coaches and fellow players and finally be disciplined at all times. Sang Mendy the Public Relation Officer, who was lost for words, thanked Allan for coming to their aid and encouraged him to come back in the soonest of time. Other speakers in the gathering included Mr. Buba K Jallow and Alieu Sanneh, Technical Director and coach respectively. GILKOCK BRUFUT BRANCH JOINS THOUSANDS IN HIS EXCELLENCY’S KANILAI FARM. Sixty Eight interns (players) of Gilkock Football Academy left Brufut on Friday August 31st for Kanilai to participate in His Excellency’s farm. 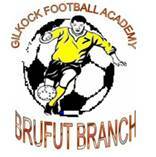 The Brufut based Gilkock academy joined the Western Region Sports Committees led by Lamin King Colley. Before the Academy departs for Kanilai, Mr. Buba k Kallow, Technical Director of the Academy expressed delight of being part of the team to Kanilai noting “we have been yarning for it”. He advised the interns to work very hard whilst in Kanilai and represent the name of the Academy well. On Saturday and Sunday the Academy joined the Western Region Sports Committees and a host of other people from across the country and beyond at the presidents rice field. Speaking to the Academy website after work Lamin King Colley the head of delegation thanked the Academy for coming to participate. He also noted that “as the country’s number one supporter of sports both financially and morally, it is important for sport bodies in the country to also render service to His Excellency and the best way to do so is to help in his farm because one day it might be ploughed back to sports”. Amadou Jaiteh Chairman Brufut Youth and Sport Development Committee and head of delegation of the Brufut Branch Academy hailed the Academy for its foresightedness and were full of praises for their wonderful participation on the farm. Sang Mendy PRO of the Academy, thanked both Amadou and King for putting the Academy in the Kanilai trip. “As an organized body we are prepared to answer to His Excellency’s call at any time to show his unflinching support in sports Sang concluded”. September 8th marks another important day in the history of Gilkock Football Academy of Brufut as players and coaches of the Academy were joined by other people to witness the handing over ceremony of football kits donated by Iain Kitchen a British national through Mariejorfy Garforth. Delivering his opening remarks coach Bubacarr Boris Demba said the Academy has a great prospect and if given supports aid like this it will very soon provide the long awaiting results the people of Brufut have been waiting for noting that the academy is geared towards spotting talent and developing them into future stars. As a role model to the players of the Academy, Ebrima Jatta, who just returned from his trial at Reading FC, shared his experience with the interns of the Academy and was present in the handing over ceremony. He advised the interns of the Academy to stead fast and work hard towards achieving good in football which is a big business today. In conclusion he thanked the donor for a noble gesture and urges the players to be disciplined and avoid mingling with all sorts of people. Sheriffo jarju who represented the donor on behalf of Mariejofy Garforth expressed delight of the donation made to the Academy in which his son is part of. Sheriffo also commended Sang Mendy the PRO and Secretary of the Academy for facilitating the acquisition of the kits and thanked the donor for the gesture. He also advised the players to focus on the Academy and avoid anything that can hinder their progress in the future. He finally reaffirmed his committee commitments in helping the academy grow as they have seen the immense contribution the Academy has done in the development of football in Brufut. Sang Mendy PRO and Secretary of the Academy commended the donor, Mr. John Carter, Mr. Greg Pickett, Friends of the Gambia representatives in the Gambia for without whom it would have been difficult for the material to reach the Academy. Lamin Ceesay a representative of the players who gave the vote of thanks said he is very pleased with the donation and called on all stakeholders to come to the aid of the Academy.